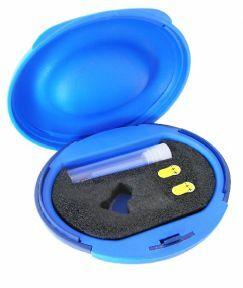 Blue Wireless Earpiece Box Complete with Batteries (10AE), 2 spare wax traps and fitting tool. Blue Wireless Earpiece Box. Complete with Batteries (10AE), 2 spare wax traps and fitting tool. It has a hard outer shell with a latching lid. The inside of the case provides a soft and secure way of making sure that your earpiece does not get damaged. The foam insert has provision for a wax trap tool and two additional batteries to be carried with you at all times.